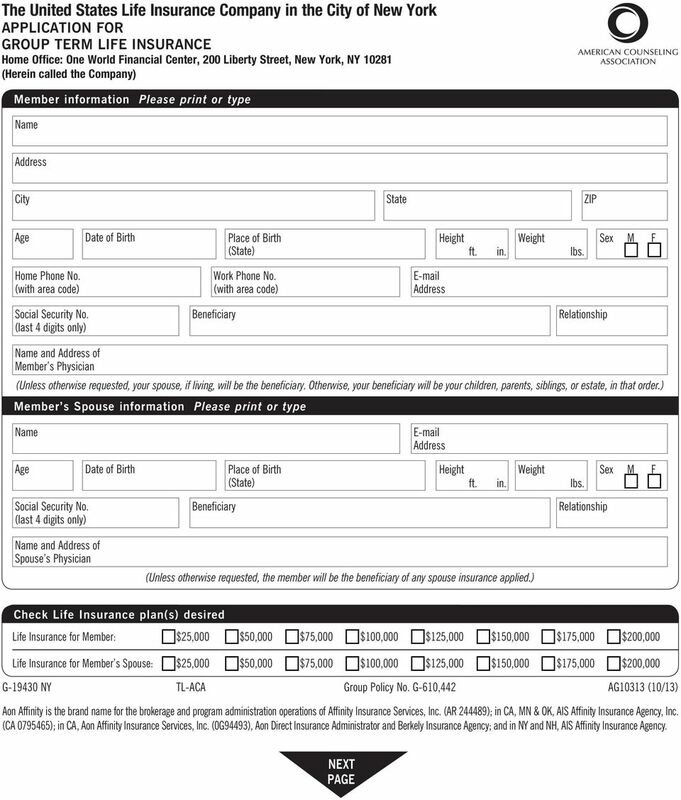 Download "Check Life Insurance plan(s) desired Life Insurance for Member: $25,000 $50,000 $75,000 $100,000 $125,000 $150,000 $175,000 $200,000"
7 The United States Life Insurance Company in the City of New York APPENDIX 10C: INSURANCE DEPARTMENT OF THE STATE OF NEW YORK IMPORTANT NOTICE REGARDING REPLACEMENT OR CHANGE OF LIFE INSURANCE POLICIES OR ANNUITY CONTRACTS THIS NOTICE IS FOR YOUR BENEFIT AND REQUIRED BY REGULATION NO. 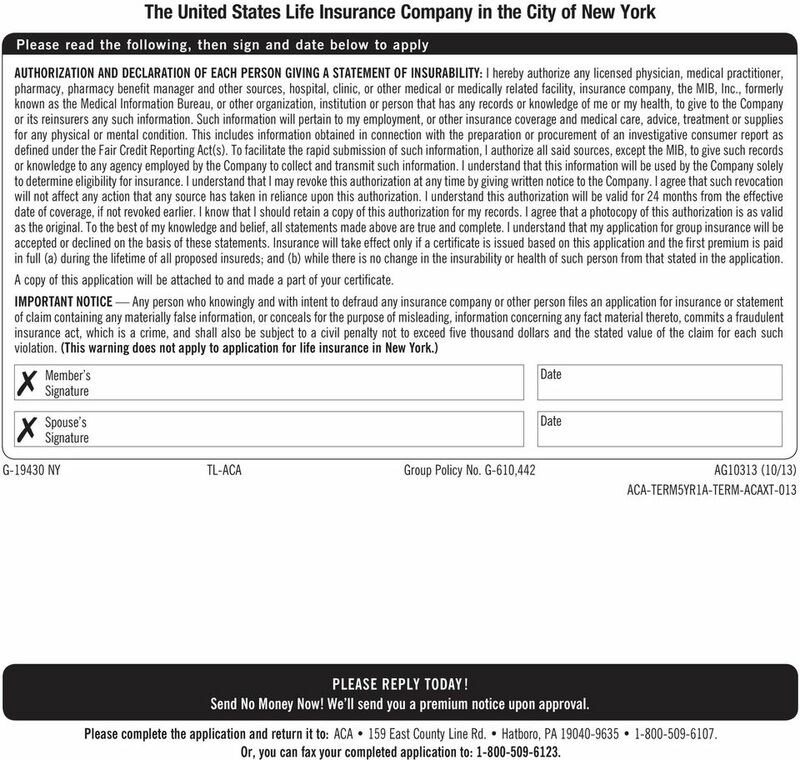 60 You are contemplating the purchase of a life insurance policy or annuity contract in connection with the surrender, lapse or change of existing life insurance policies or annuity contracts. Your decision could be a good one or a mistake so make sure you understand the facts. You should: 1. Ask the Company from whom you bought your existing life insurance policies or annuity contracts to review with you the transaction(s). You may be able to effect the changes you desire more advantageously with them. 2. Consult your tax advisor. There may be unfavorable tax implications associated with the contemplated changes to your existing life insurance policies or annuity contracts. As a general rule, it is often not advantageous to drop or change existing coverage in favor of new coverage, whether issued by the same or a different insurance company. Some of the reasons it may be disadvantageous are: 1. The amount of the annual premium under an existing life insurance policy may be lower than that called for by a new life insurance policy having the same or similar benefits. Any replacement of the same type of policy will normally be at a higher premium rate based upon the insured s then attained age. 2. Since the initial costs of a life insurance policy are charged against the cash value increases in the earlier life insurance policy years, the replacement of an old life insurance policy by a new one results in the policyholder sustaining the burden of these costs twice. Annuity contracts usually contain provisions for surrender charges, therefore a replacement involving annuity contracts may result in the imposition of surrender charges. 3. 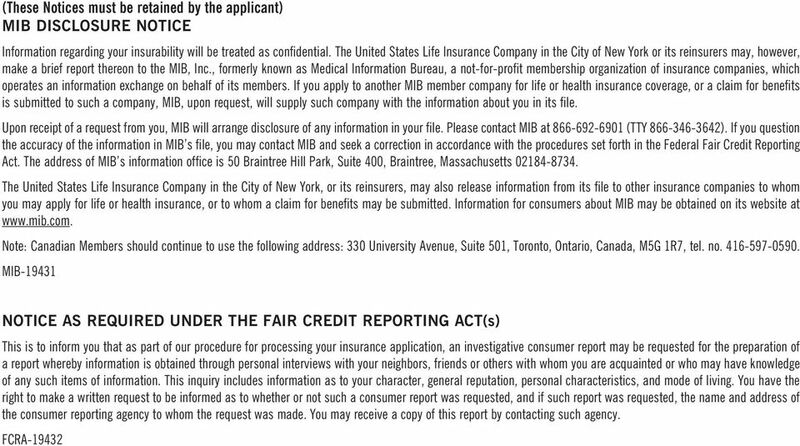 The incontestable and suicide clauses begin anew in a new life insurance policy. This could result in a claim being denied under the new life insurance policy that would have been paid under the life insurance policy that was replaced. 4. An existing life insurance policy or annuity contract often has more favorable provisions than a new life insurance policy or annuity contract in areas such as loan interest rate, settlement options, disability benefits and tax treatment. 5. There may have been changes in your health since the purchase of the existing coverage. 6. The insurance company with which you have existing coverage can often make a desired change on terms that would be more favorable than if you replaced existing coverage with new coverage. 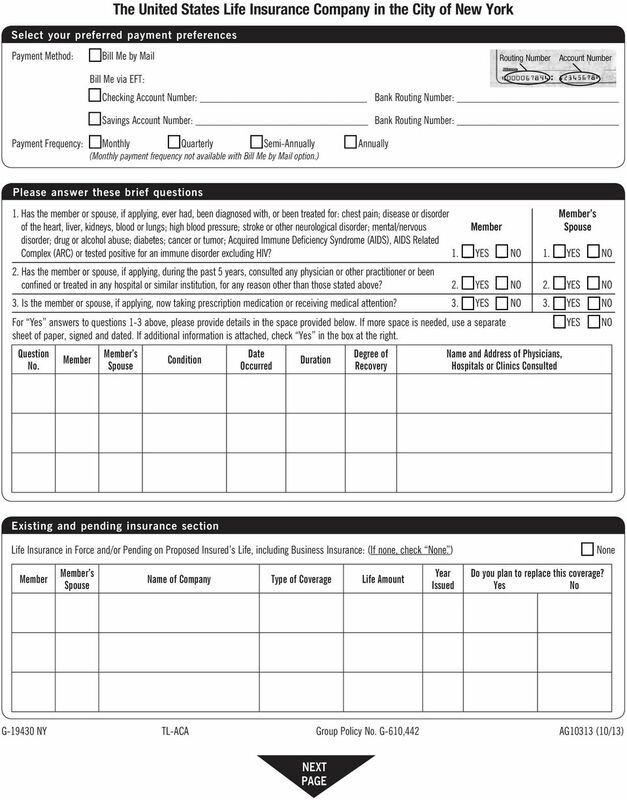 You have the right, within 60 days from the date of delivery of a new life insurance policy or annuity contract, to return it to the insurer and receive an unconditional full refund of all premiums or considerations paid on it, or in the case of a variable or market value adjustment policy or contract, a payment of the cash surrender benefits provided under the policy or contract, plus the amount of all fees and other charges deducted from gross considerations or imposed under the life insurance policy or annuity contract, and may have the right to reinstate or restore any life insurance policies and annuity contracts that were surrendered, lapsed or changed in the transaction to their former status to the extent possible and in accordance with the insurer s published reinstatement rules to the extent such rules are not inconsistent with the provisions of this part. 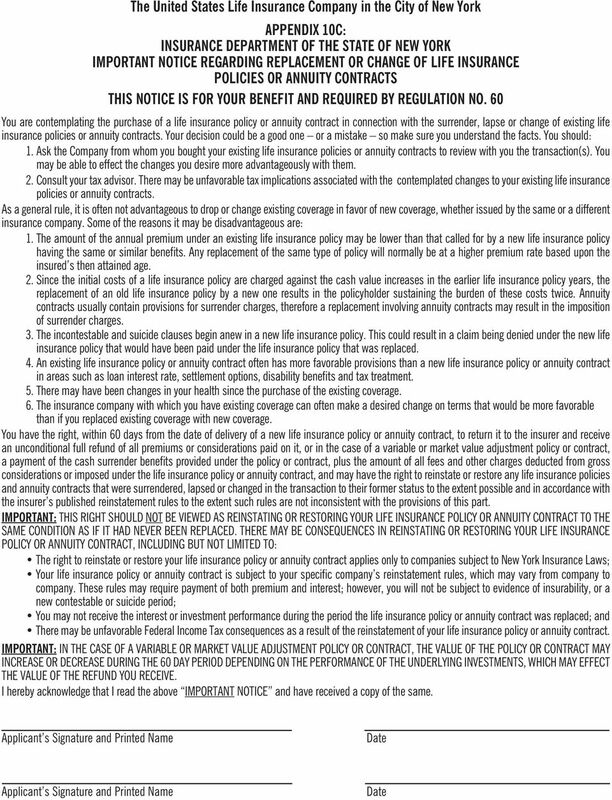 IMPORTANT: THIS RIGHT SHOULD NOT BE VIEWED AS REINSTATING OR RESTORING YOUR LIFE INSURANCE POLICY OR ANNUITY CONTRACT TO THE SAME CONDITION AS IF IT HAD NEVER BEEN REPLACED. 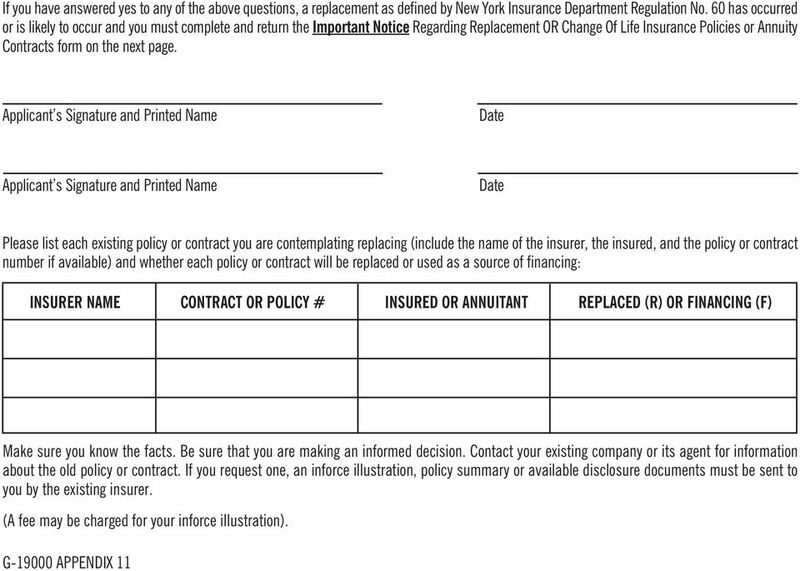 THERE MAY BE CONSEQUENCES IN REINSTATING OR RESTORING YOUR LIFE INSURANCE POLICY OR ANNUITY CONTRACT, INCLUDING BUT NOT LIMITED TO: The right to reinstate or restore your life insurance policy or annuity contract applies only to companies subject to New York Insurance Laws; Your life insurance policy or annuity contract is subject to your specific company s reinstatement rules, which may vary from company to company. 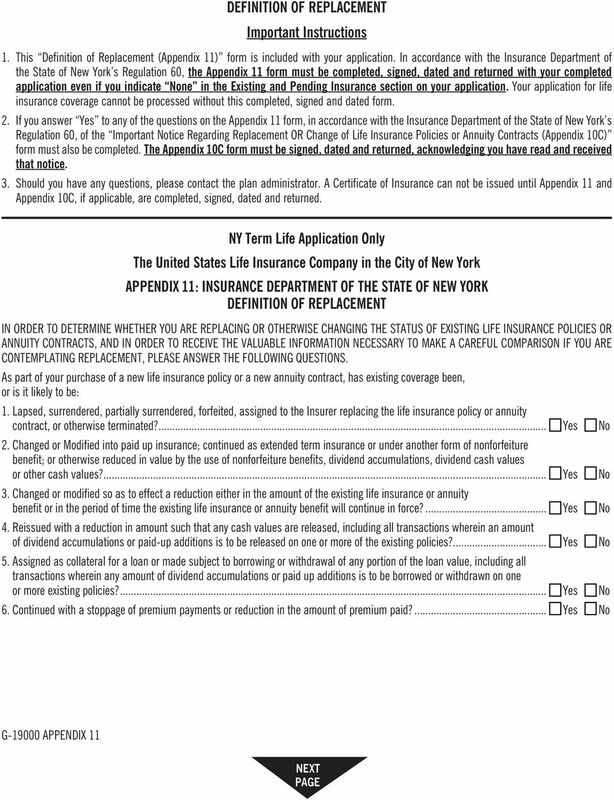 These rules may require payment of both premium and interest; however, you will not be subject to evidence of insurability, or a new contestable or suicide period; You may not receive the interest or investment performance during the period the life insurance policy or annuity contract was replaced; and There may be unfavorable Federal Income Tax consequences as a result of the reinstatement of your life insurance policy or annuity contract. IMPORTANT: IN THE CASE OF A VARIABLE OR MARKET VALUE ADJUSTMENT POLICY OR CONTRACT, THE VALUE OF THE POLICY OR CONTRACT MAY INCREASE OR DECREASE DURING THE 60 DAY PERIOD DEPENDING ON THE PERFORMANCE OF THE UNDERLYING INVESTMENTS, WHICH MAY EFFECT THE VALUE OF THE REFUND YOU RECEIVE. I hereby acknowledge that I read the above IMPORTANT NOTICE and have received a copy of the same.